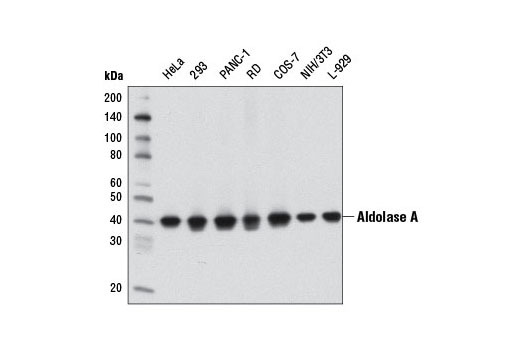 Western blot analysis of extracts from various cell lines using Aldolase A (D73H4) Rabbit mAb. Aldolase A (D73H4) Rabbit mAb recognizes endogenous levels of total fructose bisphosphate aldolase A protein. This antibody may detect total fructose bisphosphate aldolase B and fructose bisphosphate aldolase C proteins. Monoclonal antibody is produced by immunizing animals with a synthetic peptide corresponding to residues surrounding Pro263 of human fructose bisphosphate aldolase A protein. Aldolase (fructose bisphosphate aldolase), a glycolytic enzyme, catalyzes the conversion of fructose 1, 6-bisphosphate to 3-phosphoglyceraldehyde. This ubiquitous enzyme is present as three different isozymes: aldolase A, aldolase B, and aldolase C. Research studies suggest that aldolase A expression potentially differentiates between nonneoplastic liver diseases and hepatocarcinoma (1). Furthermore, investigators have shown that changes in aldolase B gene expression levels have been observed in certain patients with this primary tumor (2,3).